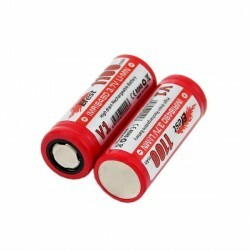 Efest IMR 18490 Li-Mn 1100mAh high drain rechargeable battery button top. These IMR cells have much lower internal resistance than regular LiIon 3.7V cells and they may end up with a higher ending voltage when charged in certain chargers ( especially older versions of the WF-139 charger ). Please check the voltage of your 18490 IMR battery right out of the charger to see if they are above 4.20V when fully charged with your charger. You can do this with a Multimeter Overcharging above 4.25V may shorten life/cycles. Above 4.50V may even damage them. DO NOT use the charger if it is overcharging IMR cells. - Do not dispose of in fire.We do not recommend unprotected batteries in devices that they're not recommended to be used in, use at your own risk. If used in our devices using our Hot Spring, if there is a short the spring will collapse. Do not Use adapters with these batteries. They should never be discharged below 2.5 volts or cycle life/performance will be reduce.